If you’ve been reading about Soliloquy or browsing the blog, you might have asked yourself this question: What are carousel sliders? What’s the difference between a slider and a carousel? And when should you use the Carousel Addon instead of just making a normal slider? Let’s answer these questions so you can create the slider you want. What’s the difference between a carousel and a slider? What is the Carousel Addon? “Sliders” is an all-encompassing term that refers to any web element that rotates through a set of images, videos, or text. That’s it! Sliders can refer to product sliders, horizontal or vertical sliders, automatic slideshows, or lightbox sliders. Carousels, on the other hand, are a specific type of slider that acts a little differently. Instead of showing a single large image at a time, or a slider with thumbnails below it, carousels show multiple images in a row. There are plenty of situations where using a carousel would be the better option. Using a typical image slider is great if you want one slide to be the focus at once, like if you’re promoting events or showing off photography. But carousels allow you to bring multiple slides into focus, essentially tripling or quadrupling your chances of catching a visitor’s eye. A carousel would look great as a product image slider on an e-commerce store, so customers can see all the product images at once. Carousels are a good choice if you have a lot of important info in a slider you don’t want anyone to miss, and a well-made carousel can entice visitors to click through the whole slider. If you want to make your own carousel slider, Soliloquy comes with the Carousel Slider addon. Like any Soliloquy addon, all this does is add a few more options during the slider creation process, enabling you to turn on carousel functionality at the toggle of a switch. 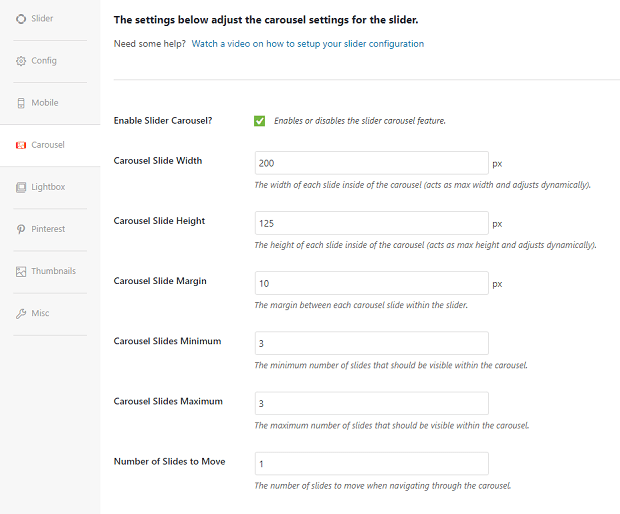 The Carousel addon comes with a ton of options so you can configure your slider exactly how you like it. Change how many images appear per slide, how many moves per navigation, and the size of the slider. And it all looks just as great on mobile as it does on your computer. The Carousel addon is also compatible with all of Soliloquy’s other settings and extensions. Featured Content carousel? Or a carousel with videos, captions, or lightbox settings? Go wild with your designs. To use the Carousel addon, you’ll need a Developer license or higher. Creating a carousel is very similar to making a normal slider. Once you’ve installed Soliloquy, go to your admin dashboard and click Soliloquy » Add New. Upload your images and play with some of the settings. In the lower settings area, you should see the Carousel tab. Tick Enable Slider Carousel? and your slider is now in carousel mode! Change the width and height, as well as how many slides you want to be visible at once. Now just use the shortcode in the sidebar to display your new slider on any post or page. Click Preview or save the page to see it in action! Whether you use a slider or a carousel all depends on what type of website you’re building, where the slider is, and what it’s meant to do. Now that you know what a carousel is and the best times to use them, you might want to check out how to create a responsive carousel slider. Get your mobile-responsive slider up and running in minutes! If this guide was helpful, let us know by following us on Facebook and Twitter.